We’ve paved the way for a whole new category of diagnostic imaging. ALICAM® allows dogs to be imaged at home or in the clinic without having to purchase expensive capital equipment. There is no sedation or anesthesia required, and no need to restrict the pet’s activity. What is Ambulatory Light-Based Imaging (ALI)? Ambulatory light-based imaging (ALI) is a revolutionary medical imaging modality based on the visible light spectrum (λ = 390-700 nm) that uses an array of photo sensors and an internal light source to generate high-resolution images in ambulatory patients. This gives veterinarians unprecedented diagnostic access to the entire GI tract. ALI can provide a detailed diagnosis of what is ailing our pets while they go about their normal day. ALICAM is the perfect all-in-one imaging solution for any veterinarian. Everything needed to perform a study is contained within a tiny, single-use capsule. We’ve eliminated the bulky equipment and the costs associated with traditional imaging techniques. Four cameras mounted inside the capsule capture 360-degree, high-resolution images that are stored in an on-board memory system. 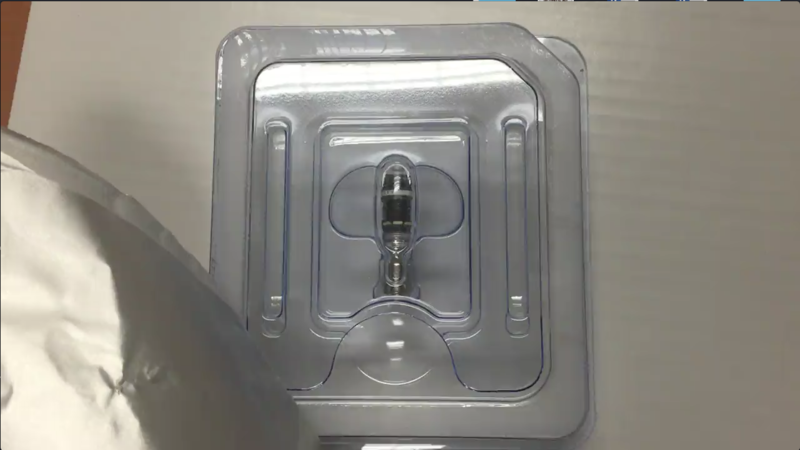 Removing the capsule from the package activates a series of LED lights and turns the cameras on. The dog swallows ALICAM, which takes thousands of panoramic images as it is propelled through the GI tract by peristalsis. Proprietary technology detects motion and allows ALICAM to “sleep” when it isn’t moving so that battery life is maximized. Once ALICAM has been recovered, images are downloaded and analyzed. A veterinary specialist at Infiniti Medical will take into account the dog’s history and presentation and prepare a detailed report, highlighting areas of concern along with treatment recommendations. As ALICAM travels through the GI tract, cameras take 360-degree, high-resolution images, detecting and recording areas of concern. The dog can be fully active, without restrictions. A detailed medical report with treatment recommendations is prepared for the veterinarian. ALICAM provides a new level of convenience and diagnostic capability. Just administer ALICAM like a pill and wait. Peristalsis carries ALICAM through the GI tract as it records high-resolution images. Images are downloaded from the capsule and a detailed report is prepared by one of Infiniti Medical’s specialists. Nothing could be simpler for the dog or the veterinarian. Using patented ALI technology, ALICAM captures 360-degree panoramic images of the entire GI tract. The capsule is optimized with extended battery life, multiple LED light sources, and software that auto-focuses and adjusts exposure based on location and ambient light. Motion-sensing technology allows the capsule to “sleep” when not moving. The result is thousands of vivid images and an accurate diagnosis. Once the ALICAM capsule has completed its journey, the board-certified specialists at Infiniti Medical will partner with the veterinarian by providing a customized visual report. This report provides tailored treatment recommendations and is delivered electronically to the veterinarian for quick implementation. There’s no need to learn new software or how to interpret ALICAM images. We provide you with the answers you need to provide the best care for your patients. If you can give a dog a pill, you can use ALICAM. With ALICAM, you’ll be amazed at what you can learn while a dog is at home, going for a walk, or catching a Frisbee. Utilizing this advanced technology means more convenience for dog owners and their pets while improving quality of care. Provide the best care for your patients and take the guesswork out of GI disease. ALICAM is so simple that if you can administer a pill, you can greatly expand the scope of your practice. Once the capsule is recovered, a team of board-certified veterinary specialists from Infiniti Medical will analyze the data for you and deliver a comprehensive report with detailed images and clinical recommendations for treatment. There’s no need to spend thousands of dollars on equipment or take courses on how to interpret imaging findings. Enhance your in-house diagnostic capabilities and your bottom line for more-efficient practice management. Is ALICAM right for your dog? Reach out, and one of our team members will get in touch.